BALTIMORE, MD, May 19, 2015 – A major independent survey of Caritas organizations around the world points to the best way to end hunger – help small farmers, especially as they try to adapt to the changing climate. The survey was presented by Cardinal Oscar Rodriguez Maradiaga, outgoing President of Caritas Internationalis, to new President, Cardinal Luis Antonio Tagle, today at EXPO 2015 in Milan. According to 99 Caritas organizations, the national Catholic charities in countries comprising 83 percent of the world’s population, the top three causes of food insecurity are lack of resources – land, seeds, loans, access to markets – for small farmers, low agricultural productivity, and the impact of climate change. Dr. Carolyn Woo, president of Catholic Relief Services (CRS) said, “this survey echoes what we are told daily. Small farmers struggle to put food on the table year round and in many areas changing weather patterns are making farming even more difficult for them.” CRS partnered in the survey’s creation. 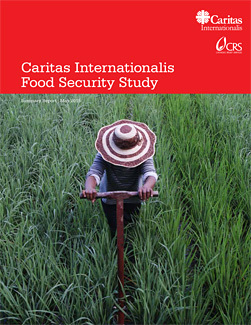 Just 19 percent of Caritas respondents said that their countries enjoyed full food security, defined as reliable access to a sufficient quantity of affordable, nutritious food. Almost a third said their countries faced food insecurity, and almost half said their countries were only somewhat secure in their food resources. The results of food insecurity were not just hunger and malnutrition, but also migration, income disparity, and crime. Lack of adequate food impacted not just health and mortality, but also education, corruption and a culture of dependence on handouts and welfare. Though the responses as to how to address hunger were wide ranging, over a third of those responding to the survey said the single most important action that would reduce hunger, malnutrition, and food insecurity is improving agriculture (35%). Seventeen percent pointed to changing economic or social welfare policies (17%). “This clearly shows that solutions need to address local circumstances,” said Dr. Woo. Caritas offices which provide food security programs within their own countries estimated that an average of 1.36 million people had benefitted from those programs in 2013. The top areas of focus were farmer training (41%), sustainable agriculture (39%), food or seed distribution after emergencies (39%), and improving nutrition and health (39%). There were significant variations among regions in the reasons for hunger and food insecurity. Caritas offices in Sub-Saharan Africa emphasized low agricultural productivity and climate change more than did people in most other regions. In Asia, the emphasis was on lack of smallholder farmer access to resources, plus the lack of governance. Respondents in Latin America and the Caribbean shone the spotlight on food price speculation and lack of infrastructure. Middle East and North Africa struggled more than most with conflict and lack of clean water. Caritas Internationalis is a global confederation of Catholic relief and development agencies operating in over 200 countries and territories worldwide. The study was carried out by Caritas Internationalis, Catholic Relief Services, and Grey Matter Research & Consulting. Ninety eight out of Caritas’ 164 member organizations took part in the survey. To interview experts on this topic, contact Tom Price (contact info above). Catholic Relief Services is the official international humanitarian agency of the Catholic community in the United States. The agency alleviates suffering and provides assistance to people in need in more than 100 countries, without regard to race, religion or nationality. CRS’ relief and development work is accomplished through programs of emergency response, HIV, health, agriculture, education, microfinance and peacebuilding. For more information, please visit crs.org or crsespanol.org and follow CRS on social media: Facebook, Twitter at @CatholicRelief and @CRSnews, Google+, Pinterest and YouTube.